You have to wonder if desperation turns phone developers into geniuses. With time running out on Palm, the Palm Pre is introduced at CES in January 2009 along with webOS. Motorola also is about to be a name of the past but the company pulls the Motorola DROID out of its hat and the Android Invasion begins. Nokia, dropping to third from its perch at number one in the global smartphone rankings, where it sat for 14 years, introduces the MeeGo powered Nokia N9 to applause. Now comes RIM with a stock making new lows, executives leaving the company, and earnings below expectations, needing a miracle. And yes, BlackBerry fans, there could be a miracle in the making. According to sources for N4BB, RIM has stopped production of a 10 inch PlayBook and instead, is developing a QNX powered 'Superphone'. This model is expected to have a 4.3 inch screen with resolution of "900+", although we're not really sure what that should mean. Under the hood will be the same single-core 1.2GHz processor that will be in the upcoming BlackBerry Bold 9900. RIM had considered a dual-core processor to be a battery killer, although it is not too late for them to change up to a dual-core chip. Sound good? With a 10 inch BlackBerry PlayBook said to no longer be worked on, RIM will push out the 4G LTE version of its 7 inch PlayBook in October, according to the source. BlackBerry fans have been hoping that a QNX powered phone would be coming soon. And now, as the clock ticks down to a precious few seconds, here is another manufacturer throwing a Hail Mary pass with the game on the line. Is it really Nokia is on third place for now? As far as I know Nokia is continuously dropping there market shares, however they're still the number one smartphone manufacturer. I still have trust on RIM, though I must admit that they have been left behind by Manufactureres such as Samsung and HTC partly becuase these manufactures only put up the hardware only the OS is an out of the shelf product. The BlackBerry service is what matters to me the most. Competition is great for us consumers so I hope RIM turns it around for our sake. That said I jumped ship to the Droid X after RIM announced the Torch. I figured if that was the best RIM could come up with to answer Apple and Google they were lost. Time to go. QNX running on phones, is gonna look like webOS. That means this new "superphone" will probably come out in 2013-14. I'm sorry but i have gotten tired of waiting for the new phones of RIM. 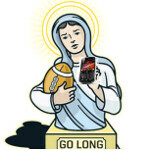 I was looking for forward to BOLD 9900 but it will probably end up getting postponed until next year... I'm just saying. If RIM can't get their 'superphone' in distribution in time for 2011 XMAS season (approximately September, 2011), they better start seriously looking for a merger parter. Personally, I wish them the best of luck, but their track record doesn't give me much confidence they will pull it off.